Where you are born and raised has more to do with how long you will live than your genetic makeup. According to a study by the Richard M. Fairbanks School of Public Health at Indiana University Purdue University-Indianapolis, Indiana is not a great place to live if you expect to see many days past 80 years old. Lisa Staten is an associate professor of social and behavioral sciences at the school and one of the authors of the study. Staten said that "the United States in the world is ranked 43rd in life expectancy. We used to be one of the top, now we are 43rd. Indiana is 44th in the United States, so we are 44th in the 43rd nation." A baby born in May this year to parents who live in the 46268 ZIP code can expect a life of just under 80 years. If the parents move just a few miles away, near the Marion-Hamilton county line, life expectancy increases to 83-1/2 years. The Monon Trail is a measuring stick of life. 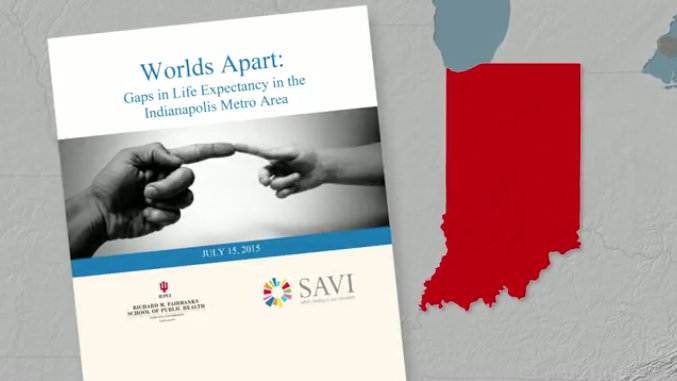 As someone moves down the Monon to the south, life expectancy drops. For those like Kevin Harmon, he said, his entire life has been spent close to the Monon in the Meridian Kessler-Broad Ripple area. According to the study, he can expect to the to see 80. "I think it has a lot to do with economics and, of course, people that go to doctors do. People that don’t have money don’t go to doctor," Harmon said. The farther south you travel on the Monon Trail, life expectancy drops even more. In the area of Dr. Andrew J. Brown Street, life expectancy is 74-1/2 years. Willie Carter has been attending The Little Bethel Baptist Church, just off that street at 3279 Winthrop Ave., for 40 years. "Your lifestyle, the type of life you live, and what is available to you as far as advancing yourself educationally … I believe some of the crime rate has some effect on the community as well. Maybe that is why we see such a low percentage in the life expectancy in this particular community," Carter said. As you get toward to the end of the Monon Trail, life expectancy bottoms out at 69.4 years. The 46225 ZIP code includes Eli Lilly’s corporate headquarters, Lucas Oil Stadium and the Old Southside neighborhood. The professor said, "That is a huge problem, and it is trying to make the point that place matters, that there are all of these resources in these areas and it includes everything from schools to access to health care to access to safe places to exercise being out and about," Staten said. According to the study, the lack of and access to decent jobs, safe housing, usable transportation, education and a clean environment have more to do with how long you will live than genes and biology. If your neighborhood is tough, it is literally taking years off your life. "If you have to take a bus and you have to carry your two bags of groceries back, as opposed to up in the suburbs where we can go load up the car and go one time and it is a much easier trip and sometimes it is cheaper in the grocery stores than it is in the inner-city areas," Staten said. The Indianapolis urban core is changing, some of it by design. Neighborhoods with lower life expectancy rates are being gentrified. "If places are gentrified, that geographic location may have a higher life expectancy down the road because you have a lot more income and resources come in, but those people have been shifted out ... so you have not impacted the people, you just created a totally different environment with different residences in those areas, so that is a huge concern and that is important to look at because down the road you are like 'Great, we raised life expectancy," but did we shove out all of those people and we haven’t really helped those people," Staten said. This story originally ran on WISH-TV.